This post is inspired by the afternoon I spent at the Tibetan border in the north part of Langtang National Park. The space between two places is that of the Bhote Kosi river, the body of water currently separating Nepal from Tibet. That space is in the midst of being closed, and a new, Chinese-funded bridge is slowly stretching its trestles across the river. Its completion will mark the start of a new over-ground link between China and India. I was so struck by this construction project, and its possible implications, that I scribbled this post in my Moleskine shortly after seeing it. Being in Nepal has provided a thousand-and-one answers to the question I was asked countless times before I left Canada: “so, why Nepal?” But before I was provided those insights, there were a few reasons I had come up with in my mind. One of them was Nepal’s crucial positioning smack between China and India, two of the fastest developing countries in the world. Amidst the rubble of a construction zone, a Nepali flag marks ones transition from Tibet into Nepal. Soon to be connecting those two places is a road: a new, Chinese-constructed highway that spits out of Tibet and runs along the Bhote Kosi river, It runs past the homes of Tibetan refugees, and will connect the country with another road that leads deep through the heart of Nepal, branching off further still onto roads that eventually lead to India. Now, the final stage in that project is being completed. The space between two places is soon to be no more. Another new piece of Chinese infrastructure is being constructed, this time in the form of a stoic concrete building and bridge, one that will link the new highway with Tibet, once and for all. The contrast between the border sides is dramatic. On the Nepali side, it’s a construction zone. Colourful Tata trucks line the road, and construction workers in red helmets hammer away industriously. The place where this is all happening is particularly significant in the sense that it was somewhere important before this construction zone dictated it as so. It’s called Rasuwa, and it’s a century-old historical site representing the remains of what was once a defence fort when Nepal and Tibet weren’t so close. Now it’s a meeting of old and new in the most literal sense. 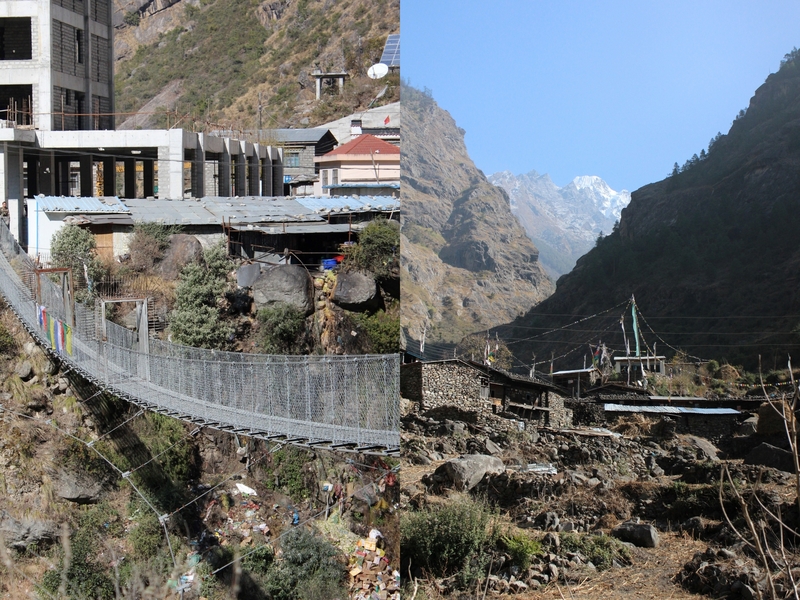 The original stone walls of Rasuwa are overshadowed by the cold structures on the other side of the Bhote Kosi. I’m perturbed by what all this could mean for Nepal. Certainly it means more income, as drivers will be required to transport goods, and that will likely create all sorts of spin-off for secondary businesses here. But still, historical heritage is being destroyed on a whim for the construction of this bridge – what does that mean in terms of future negligence? To strike the essential balance between progress and past, is anyone asking these questions? Maybe I’m wrong to be bothered so much by this space between two places. This space that is getting smaller, in this world that keeps connecting, without much thought for how and why and at what cost. Your journey is the adventure of a life time. Again, your writing gives me the sense of being there. And thank you again for telling me as much, Cheryl. It really does mean the world to me!